Mazda recalls MX-5 Miatas with software problems that can cause the cars to suddenly downshift. 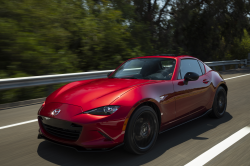 February 6, 2019 — A Mazda MX-5 Miata recall has been issued for 2016-2019 models that can suddenly downshift at any speed without warning. As with so many vehicle recalls of today, software is the culprit, in this case software for the clutch control logic in the transmission control modules. Mazda says the 14,370 MX-5 Miatas are equipped with automatic transmissions that can suffer from electrical noise when driving in "D" range, including in "manual" mode. A driver will be in for a jolt if the car downshifts without warning while driving, but Mazda says no crashes or injuries have been reported. The MX-5 Miata recall is expected to begin March 29, 2019, when dealerships will reprogram the transmission control module software. Owners may contact the automaker at 800-222-5500. Mazda's number for this recall is 3019A. Check out what Mazda MX-5 Miata drivers say about their cars.